The current work on the new railroad bridge at the Park will bring significant change to the area at the west side of the bridge. But as this 1910 era post card shows, this is not the first time this has happened. In Mr. Letchworth's time there was no Portageville entrance to the Glen Iris Estate. 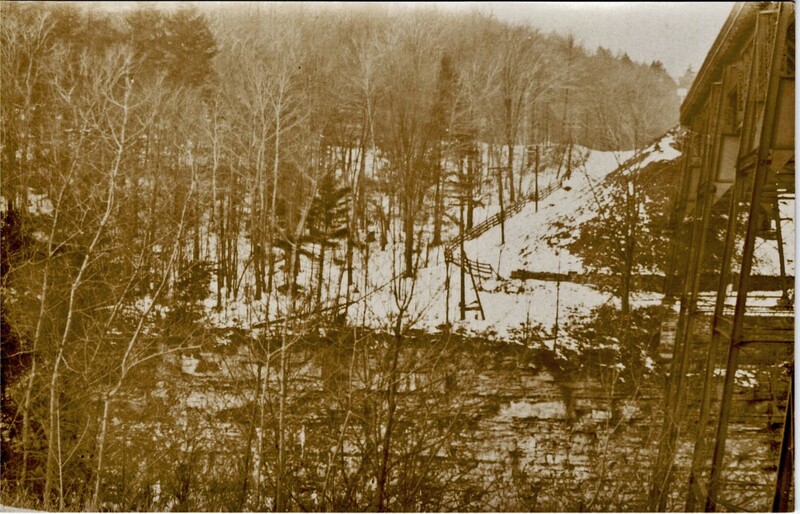 It was until 1923-24 that the southern entrance to the Letchworth Park. There was, however, a small roadway that passed under the end of the bridge and then ended in a caul-de-sac just south of the bridge. See the Minard Map or the ASHP map. If you look carefully to the left of the bridge and tracks, you will see what appears to be a roadway going up the bank to a level area. It is protected on the south (left in photo) by a wooden fence that ends in what might have once been a gate. Because of the snow it is not clear where the old road way runs under the bridge. A stone wall is visible, but it appears the bank is steep behind it and the wall serves to hold back the bank. It would seem likely then that the orginal roadway ran between the wall and the edge of the bank like the modern road today. If that was indeed the case this spot was not for the faint hearted, especially in the winter!